This Spring marks the 7th season of my NYC Audubon bird walks in Bryant Park. In the ensuing years, Bryant Park has become renowned as a bird-watching hot spot and migrant trap. Rarities and hard-to-spot species such as American Woodcock, Sora, Prothonotary Warbler, and Saltmarsh Sparrow have all been spotted on the walks, and have drawn hundreds of birders from around NYC and beyond to the park. This season's tour series commenced on a high note, and further cemented the park's reputation among birders as a place of remarkable possibility. While the walk started slowly, with a few of the expected Song and White-throated Sparrows, things quickly got interesting. A trio of Hermit Thrushes alighted in the planetree branches overhead. A Brown Thrasher flitted in the treetops. And a brown lump on a planetree branch behind the library turned out to be a large roosting bird. But what kind of bird? A closer examination revealed its long body, large head, and cryptic mottled brown plumage. Also distinctive was its lengthwise roosting posture on the branch. It was clearly some sort of Nightjar (also known by the odd name of Goatsuckers). Three species are known from our area, but none had ever been reported from Bryant Park: the Common Nighthawk, Eastern Whip-poor-will, and Chuck-will's-widow. They are all medium-sized nocturnal birds with long wings and loud voices (the latter two species are named onomatopoeically for their calls). I quickly eliminated Common Nighthawk as a possibility by the brown rather than gray plumage, the fact that it had a longer tail than wings, and relatively large head. Now the challenge was to distinguish between Whip-poor-will and Chuck-will's-widow. As these are uncommon, nocturnal species, heard far more often than seen, I haven't had enough experience observing either to feel comfortable quickly IDing them by sight alone. I did, however, know that this was a female regardless of which species she turned out to be: males of both have white outer tail-feathers, and females have buffy-tan corners on the tail. I quickly got word of the sighting out to other birders via text, Facebook, and email. Thank goodness for technology! It was like the birding bat-signal, and within minutes numerous additional birders appeared in search of the bird. One of them had a camera with a telephoto lens, and with his photos we were able to see enough details to determine it was likely a Chuck-will's-widow: a buffier undertail, large overall size, and lack of a dark stripe on the crown. This determination was confirmed by other knowledgeable birders, making me more confident in my assessment. 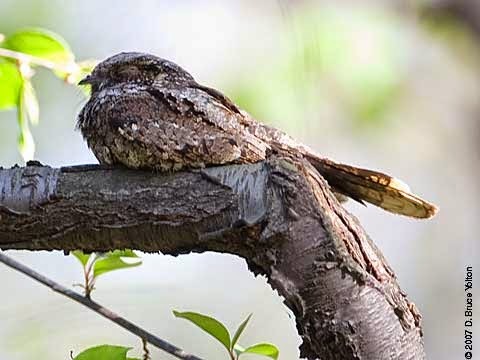 This is the rarest of the three nightjars in NYC, largely a more southern species, with a few breeding records from piney woods on Long Island, but generally evocative of humid summer evenings in the south. There are typically one or two sightings per year in NYC, and here was one in the heart of midtown, sitting right out in the open on a branch! The Chuck-will's-widow remained in the park for about a week, allowing hundreds to view this rare bird. In fact, it may still be here now, although I was unable to locate it on my Monday walk of 4/20. Who knows what the remainder of the season will bring? Spring migration is just getting underway, and will peak sometime in early May. Already, three heretofore never-recorded species have been added to the park list this spring, bringing the total to 116 species! Join us on our twice-weekly walks to see what other surprises the season may have in store.